Residents living in Jelambar Sub-district have proposed the Latumenten Flyover construction in Musrenbang of Grogol Petamburan Sub-district, West Jakarta, Tuesday (3/6).
" Most residents' proposals are dominated by physical proposals, such as repair of drainage, road and street light"
Petambu ran Grogol Sub-district Head, Achmad Sajidin said it is proposed to parse traffic jam at the railway crossing of Jalan Raya Latumenten. "One of the hundreds of interesting proposals discussed in the sub-district-level Musrenbang is construction of flyover as traffic jam solution at the railway crossing of Jalan Raya Latumenten," he expressed. His side will oversee the proposals of residents from the results of the Rembuk RW (meeting forum) to the city and provincial level. He explains the Rembuk RW results held in seven urban villages have discussed 434 proposals and 187 proposals have been rejected. 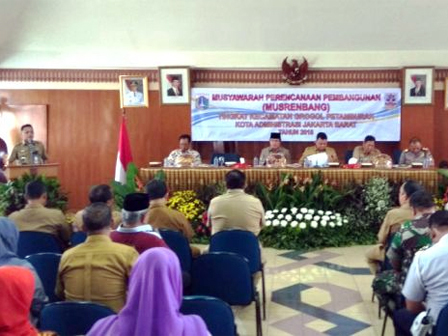 The total proposal is 621 proposals with a budget of Rp 2.3 billion. "Most residents' proposals are dominated by physical proposals, such as repair of drainage, road and street light," he explained. West Jakarta Administration Assistant, Denny Ramdhani added Musrenbang this time verifies and validates the proposals of residents and urban village-level Musrenbang. "After the validation, it will be continued and discussed at the city level, namely the UKPD forum," he said.